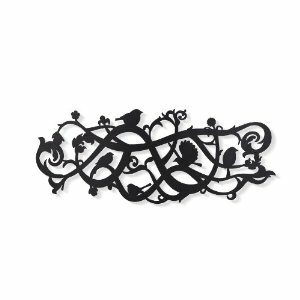 Add a touch of whimsy and romance to any room with the Birdseye decorative wall tile from Umbra. Constructed of black stamped metal, Birdseye is eye-catching over mantles, headboards, sofas and consoles. Coordinate your look with Birdseye hooks in various configurations also available from Umbra. Unit measures 28 by 12 by 1/2-inch overall. Designed by Cam Phung and Cassie Zhen for Umbra - the worldwide leader in casual, contemporary, affordable design for the home.